It's hard to believe it's been 25 years since Hayao Miyazaki founded Studio Ghibli, straight after releasing their landmark epic Nausicaä of the Valley of the Wind (alias 風の谷のナウシカ, Kaze no Tani no Naushika, 1984). While Nausicaä was groundbreaking stuff in and of itself, Miyazaki - the animator/director behind it - later set about with Ghibli to change completely the way in which we perceive animation, via the release of Spirited Away (千と千尋の神隠し, Sen to Chihiro no Kamikakushi) in 2001. But if you really want to look at the heritage behind the latest Studio Ghibli international offering – Ponyo on the Cliff by the Sea (崖の上のポニョ, Gake no Ue no Ponyo), out now in Australia and North America even though it was actually released in Japan almost two years ago – you need to funnel short-attention-spans back beyond Spirited Away. There were a bevy of equally vital Miyazaki/Ghibli offerings sandwiched between 1984 and 2001, often with a pinch or two of their hallmark moments of freestyle genre-defying, refreshing humour, and an implicit disarming madness. All these movies are a gem within their own right, each and every one laden with legions of fans pushing this or that as the Holy Grail of Ghibli anime. For some, My Neighbour Totoro (となりのトトロ, Tonari no Totoro, 1988) stands highest among these and I'd probably pipe up in their favour. 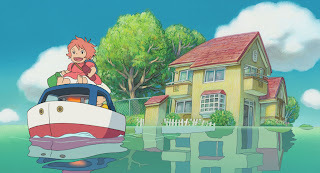 While nowhere near as thematically complex as Spirited Away or Nausicaä – the titular character here indulges in lots of top-flying, snoozing and cat bus travel – the real stars of this Miyazaki flick are four-year-old Mei and her older sister Satsuki, along with the idyllic Japanese rural backdrop that the animator/director seems to believe has been lost. The other Miyazaki movies are equal treats in completely diverse ways. Think action and adventure in Castle in the Sky (天空の城ラピュタ, Tenku no Shiro Laputa, 1986), witches and adolescence in Kiki's Delivery Service (魔女の宅急便, Majo no Takkyubin, 1989), flying pigs and anti-fascism in Porco Rosso (紅の豚, Kurenai no Buta, 1992), environmentalism in Princess Mononoke (もののけ姫, Mononoke-hime, 1997), and just about everything else in Howl's Moving Castle (ハウルの動く城, Hauru no Ugoku Shiro, 2004). Despite being now aged 69 (his birthday was in January), and having threatened to retire several times over in the past decade, Miyazaki continues to be the international golden boy of Japanese animation thanks to a belated Oscar in 2004 for Best Animated Feature (for Spirited Away) – and for this "latest" movie, Ponyo, which was an entrant in the Venice Film Festival and was officially submitted for nomination at the next Oscars (but missed out in favour of American fare like Pixar's Up, Coraline and Disney's The Princess and the Frog). There's also a new Ghibli movie in the works. Called The Borrower Arrietty (借りぐらしのアリエッティ, Karigurashi no Arrietty), it's set for release in July - although this time directed by Hiromasa Yonebayashi rather than Miyazaki. Yonebayashi previously did Key Animation on Spirited Away, Howl's Moving Castle and Ponyo. With this latest romp Miyazaki has here seen fit to reinvent his vision once again through the wondrous eyes of children. 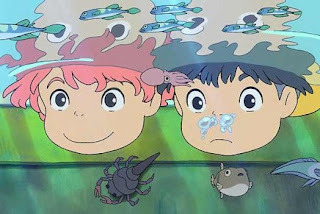 In this case those eyes belong to a changeling young fish-girl, the Ponyo of the title, who goes AWOL from her dad's underwater lair to explore the big wide world but ends up instead stranded in a small fishing village where five-year-old Sosuke lives. Already the ages should give you the gist of what to expect, with the wealth of imagination owned by a five-year-old allowing Miyazaki open slather to create a freewheeling visual platform for the madcap rush that ensues, during which mistaken vengeance, metamorphosis, manic driving, extinct fish and Noah-type floods all take a role. It's a far a simpler story-telling technique at play here that owes much more to My Neighbour Totoro than to Spirited Away. Even so, Ponyo on the Cliff by the Sea comes across as a visually stunning interpretation of the archetypal fairy tale ("The Little Mermaid"), recast within a Miyazakian dimension that recalls all the best elements of the director's earlier films (especially, for me, Panda! Go, Panda! ), along with a bubbling positivity that's been infectious enough to wear down even movie reviewers with a penchant for the cynical. 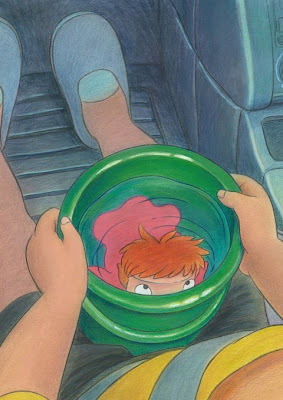 Ponyo in her human form also bears an unerring resemblance to my 4-year-old daughter Cocoa, so she won me over in no time. No wonder that the film was released on more screens than any other domestic movie when it was released in Japan in 2008, nor that it took in excess of $150 million at the Japanese box office.